San Pasqual Street is a perfect example of academic nirvana. 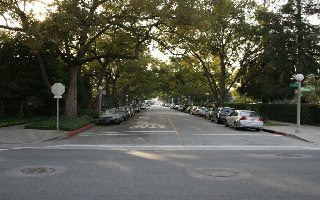 San Pasqual is a beautiful tree-lined street on the Western edge of the Caltech campus is Pasadena, Calif. The street runs parallel to the main thoroughfare California Blvd. and the section I appreciate the most is intersected by Wilson and Catalina. On one side of the street is a row of quiet, 60s-style, two-story apartment buildings, which would be very convenient for anyone with a Caltech affiliation. On the other side is an ivy-lined fence bordering a parking lot. I always park on San Pasqual whenever I go to campus because it offers 2-hour parking and there’s usually ample space to stow my car while I embark on a science adventure. Another reason I like San Pasqual is its proximity to parts of campus that I frequent. I can be over at E. Bridge (the LIGO center) within a few minutes. I can easily walk to the new Cahill Center for Astronomy and Astrophysics on California Blvd. The Spitzer Science Center is also nearby. Even if I want to head over to the Red Door Café or what used to be the bookstore, it only takes about 5 minutes. I even park on San Pasqual if I plan to eat at the venerable Pie ‘N Burger on California and Lake Boulevards. I also envision Caltech luminary Kip Thorne strolling along San Pasqual the time when he was rumored to have wandered the streets of Pasadena late one November night in 1976 to ponder over whether to recommend that Caltech pursue the LIGO project. Of course he did, and Caltech is the center of gravitational wave research. Aside from all these reasons and good will I hold for San Pasqual, there is one more reason the street will remain in my psyche for a long while. Early one balmy summer evening a couple of years ago, I was walking my familiar path among the olive trees back to my car. As I approached the intersection of San Pasqual and Wilson, I noticed the old-style street lamp on the corner, the kind with the dim, lemon-drop bulb atop. Walking slowly, comfortably, and confidently along the sidewalk was a naked lady with the only form of clothing being her pair of 4-inch heels. The very well-formed female came up to the street lamp, made a U-turn, and walked the other way in the middle of the street. I’m not sure where she was going, or why, all I know is that the image made an indelible imprint on my memory. Who knew science could be titillating as well as stimulating, or the other way around? Really? I ride my bike that way every day.